Dental implants are a permanent way of replacing a missing tooth by securely anchoring an artificial tooth root into the jaw and attaching a customized dental crown over the implant. Lance Ogata, DDS is a Kahului dental implant restoration dentist. An estimated 69 percent of Americans ages 35 to 44 have lost at least one permanent tooth, according to the American Association of Oral and Maxillofacial Surgeons. If you have a missing or highly decayed tooth that will eventually need extraction, a dental implant is an aesthetically pleasing alternative to traditional replacement methods, such as a fixed bridge or partial denture. With 26 years of experience in the dental field and imaging technology such as digital X-rays and intraoral cameras, Dr. Ogata can create dental implant restorations that look and feel as natural as your surrounding teeth. When you have a missing or highly-decayed tooth requiring dental intervention, Dr. Ogata can discuss your options for restoring your smile at his Kahului dentist office. While dental bridges and partial dentures can replace your tooth, dental implants offer a few distinct advantages. Your dental implant includes a prosthetic tooth root – When you’re missing a whole tooth, the bone density in your jaw suffers without stimulation from a tooth root. A dental implant includes a titanium rod that acts as a fax tooth root, which promotes healthy jaw bone density. Dental implants do not damage surrounding teeth or tissue – Unlike fixed bridges and dentures, a dental implant does not rest on or rub against gum tissues and does not require buffing down neighboring teeth to place, which means that you can safely restore your tooth without negatively impacting healthy structures. If you are considering a dental implant in Kahului or Maui, Dr. Ogata can take digital X-rays of your teeth and jawbone to get the detailed information he needs to create your treatment plant. These images show if you have enough healthy jawbone for an implant to be successfully implanted. If you decide a dental implant is the right intervention for you, Dr. Ogata can refer you to a trusted oral surgeon to place the dental implant and see you back in his office to finish treatment by placing your custom-made crown to the top of the implant. 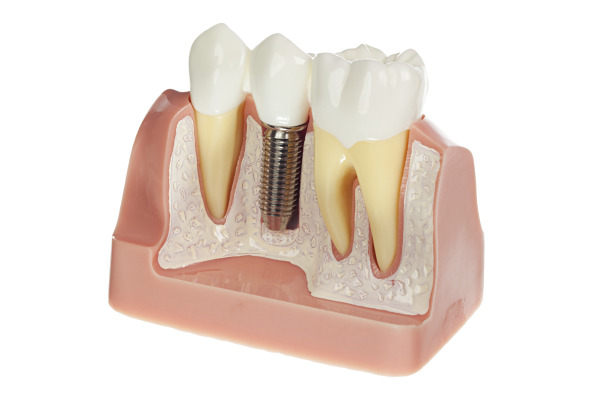 A dental implant consists of three parts: the titanium, screw-like component that inserts into your jawbone, a connector piece called an abutment attached to the implant, and a crown placed on top. If you are noticing wear and tear on your dental crown, Dr. Ogata can restore your dental implant by replacing the crown. Using advanced imaging technology and even same-day restoration services like the chairside economical restoration of esthetic ceramics (CEREC), Dr. Ogata can create your replacement crown in as little as a few hours. With the quick and easy dental implant restorations offered by our Kahului dental office, you can keep your smile looking great with only one short office visit. As a top dental implant dentist serving both Kahului and Maui, Dr. Ogata can help restore your dental implants so that you can enjoy a full, healthy smile. Contact our office today!